Border Memorial: Frontera de los Muertos is an augmented reality public art project and memorial dedicated to the thousands of migrant workers who have died along the U.S./Mexico border in recent years trying to cross the southwest desert in search of work and a better life. Built for smart phone mobile devices, this project allows people to visualize the scope of the loss of life by marking each location where human remains have been recovered with a virtual object or augmentation. 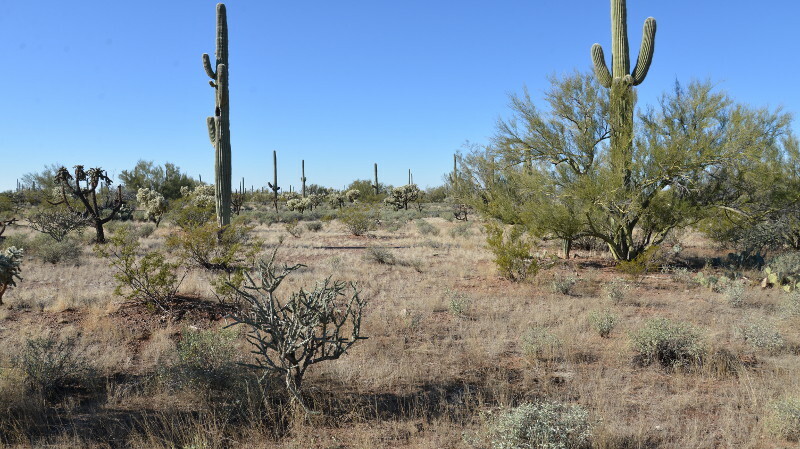 The public can simply download and launch a mobile application and aim their devices' cameras at the landscape along the border and the surrounding desert. The application uses geolocation software to superimpose individual augments at the precise GPS coordinates of each recorded death, enabling the public to see the objects integrated into the physical location as if they existed in the real world. 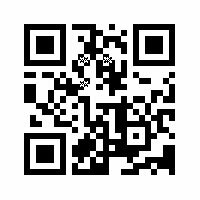 The critical commentary seeks to situate the work within the framework of new media, focusing on the themes of space and place, and the politics and ethics of positionality the project engenders. The alternative way of viewing advanced by the project offers up a radical questioning of the project of statecraft, and its governance over life and death, by presencing the dead in a contingent sense. It explores the visual representations and ethical suppositions advanced by the project, reflects on some ways to critically engage with the work, and asserts that the project is a revolutionary take on memory and mourning via a new epistemology of memory and visuality. 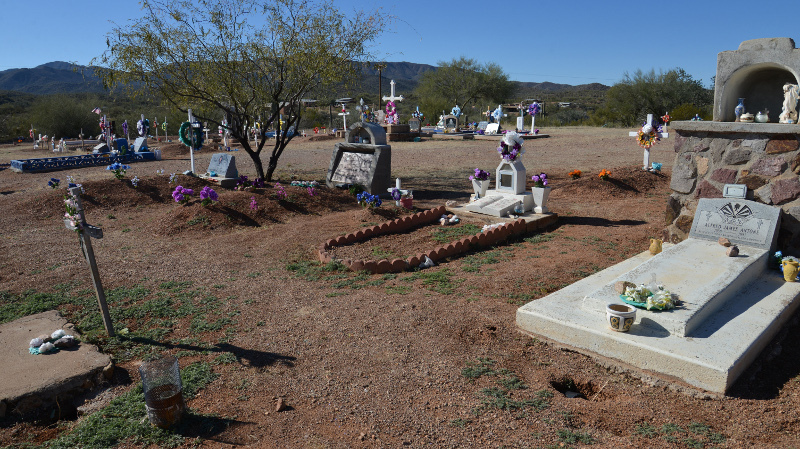 I am haunted by Border Memorial: Frontera de los Muertos. But what does that mean? 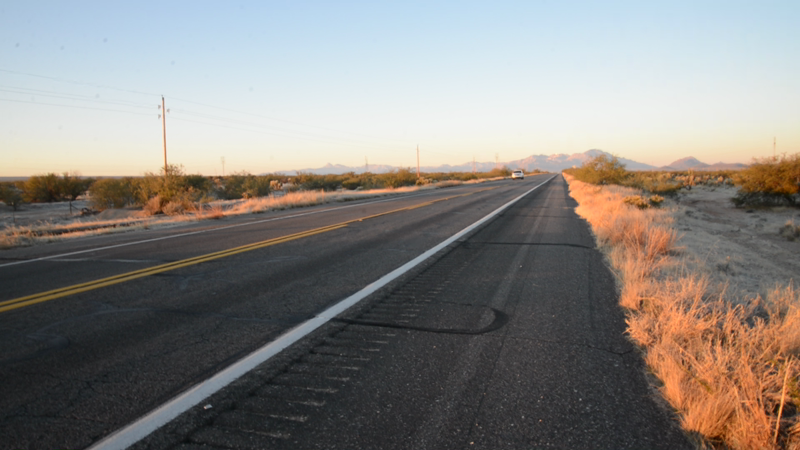 What visual representations and ethical suppositions are advanced by the project, a memorial to the undocumented immigrants who have died crossing the Arizona desert along the US-Mexico border? Their remains have blended into the desert landscape, but what might it look like to resuscitate their visual presence while still maintaining, and indeed memorializing, their vulnerability and precariousness? 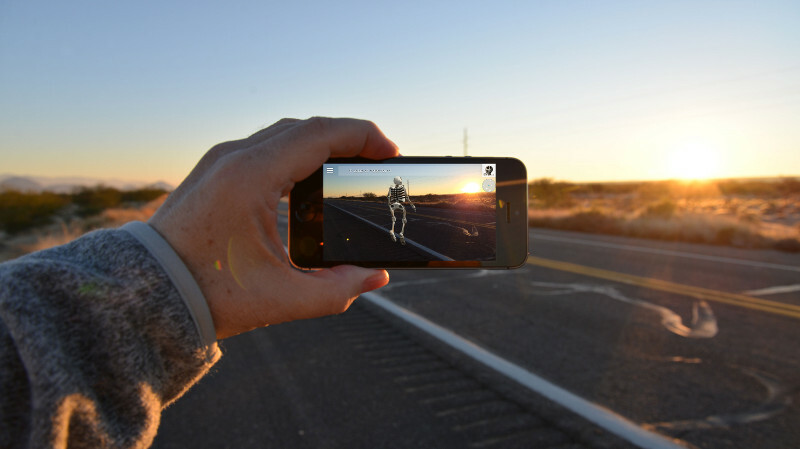 Border Memorial: Frontera de los Muertos, augmented reality public art, Yuma, Arizona, 2015. 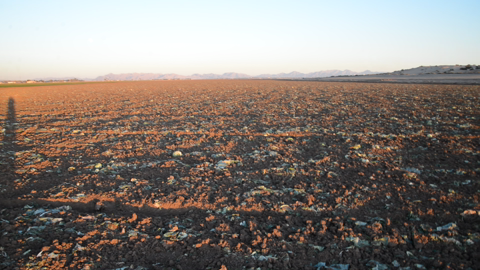 When the user visits the desert of southern Arizona and holds their smartphone up to the landscape, what looks like a Dia de Los Muertos skeleton appears on the screen in each place where a migrant has died. The skeleton itself is the same, regardless of the point on the map where it has been found. In some areas, they are so dense that it looks like an army of skeletons. The skeletons, known as calacas, are depicted in the Aztec tradition as joyous rather than mournful, because cultural beliefs dictate that death should be celebrated. AUGMENTED: Coyote Mountain, Arizona, 2015. View this image with the Aurasma Augmented Reality App. See instructions above. The image of the skeleton does not provide details about the individual found there, whether they have been identified, their name, or their physical description. 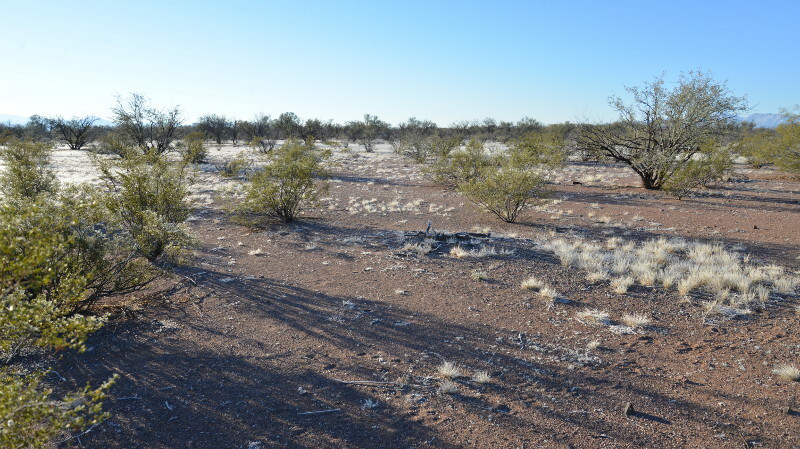 It does not mention if the remains were skeletonized by the time they had been found, or if the body was intact, or how long it had been in the desert before being found. Though the individual is not identified, it focuses on individual-level mourning and memorialization. The Vietnam Veterans Memorial, designed by Maya Lin, inspired the project; in the way that site produces an intimate encounter with a single name, even enmeshed within a larger national memorial context. The aim of this project is to cultivate an intimate one-on-one encounter with the calaca, literally "holding the memory of the individual in one's own hands." But the memory of that individual need not be connected with their name, a revolutionary take on memory and mourning. AUGMENTED: Coronado National Forest, Arizona, 2015. What does it mean to situate such a project within the idea of new media cultures? New media offers up a new epistemological and methodological basis for engaging with visuality. It is novel, and posits a form that has not previously existed simply by its moniker. Border Memorial: Frontera de Los Muertos is both a visual project and a memorial project, re-envisioning both. It cultivates a new epistemology of memory and visuality, in that the calaca, as the visual representation of the migrant who has died in this same spot, forces us to engage with alternative kinds of knowledge: knowledge means something different because it isn't about facts or information, not about migrants who died or their names or characteristics or even the details of their lives, but rather about human beings and their lives and deaths and how we conceive of these lives and deaths within our social and political communities via the mechanisms of memory and memorializations. 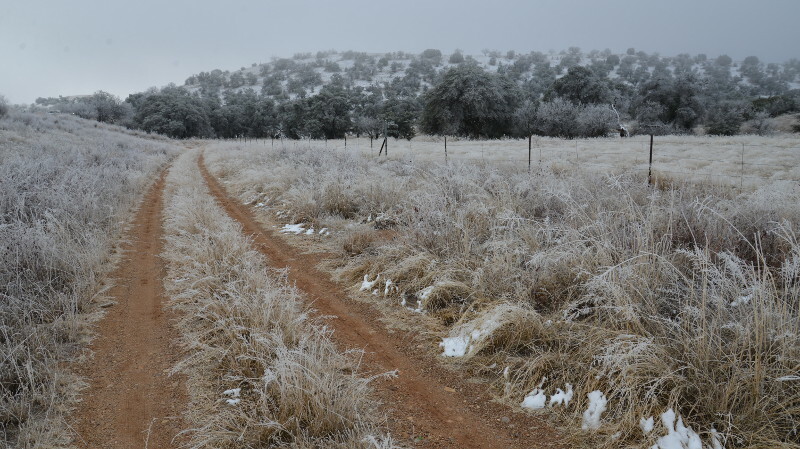 The images of a snowy landscape with the calaca remind us that the Arizona desert contains within it multitudes of climates: the harsh heat, the bitter cold, the stark sun. The project is a memorial for the death of a body or bodies that were in a struggle for life itself, one of the reasons why the body crossed the border in the first place. Thus, it exposes both the body's biological struggle for life in the harsh desert conditions – and, indeed, the ultimate failure of the body's materiality to withstand its environment – as well as the body's biopolitical struggle for qualified life in a zone of indistinction where certain bodies matter and others fade into the desert. AUGMENTED: Coyote Mountains, Arizona, 2015. The augmented reality of the project plays with notions of visible/visual engagement and invisible bodies/deaths by depicting the skeleton figure of the calaca in one's electronic device when held up to the landscape in a location where a migrant's remains have been found. Premised on immersion, emphasizing the idea that being there matters, the project also plays with intersections of visuality and materiality via the encounter with the migrant, not as he or she lived or died, but as he or she haunts in the figure of the lingering precariousness. By drawing attention to the marginalization of particular bodies and lives and deaths, it is a memorial to human vulnerability, rather than to the individuals themselves in their individuality. 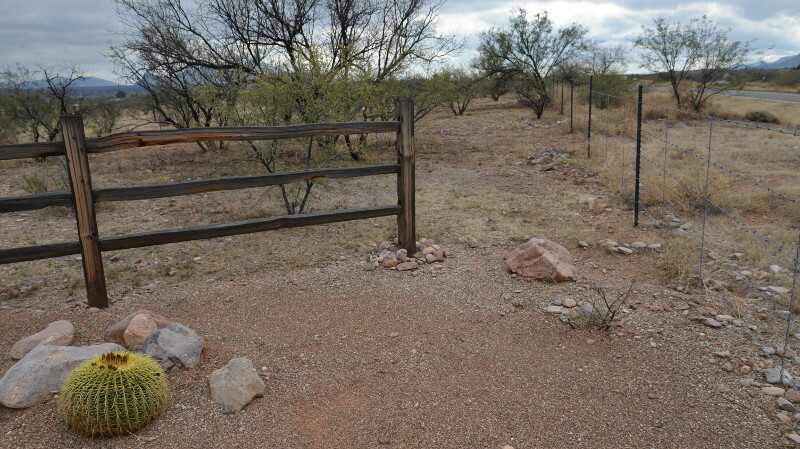 Border Memorial: Frontera de los Muertos, augmented reality public art, Three Points, Arizona, 2015. The project requires that the user be in a certain place rather than simply look at a certain place: the very definition of a new media. It is complex visuality because it cannot be simply consumed visually, without the corresponding positionality, thus asking each user to consider his or her own positionality in relation to the visible world around us, and that which cannot be captured by the visible world around us. AUGMENTED: Mt Wrightson, Arizona, 2015. What is depicted in the screen of the smartphone is both the landscape as it is, its ontological presence, but also its hauntological presence, the landscape as it isn't, through the figure of the calaca that represents the migrant who is not in reality there. 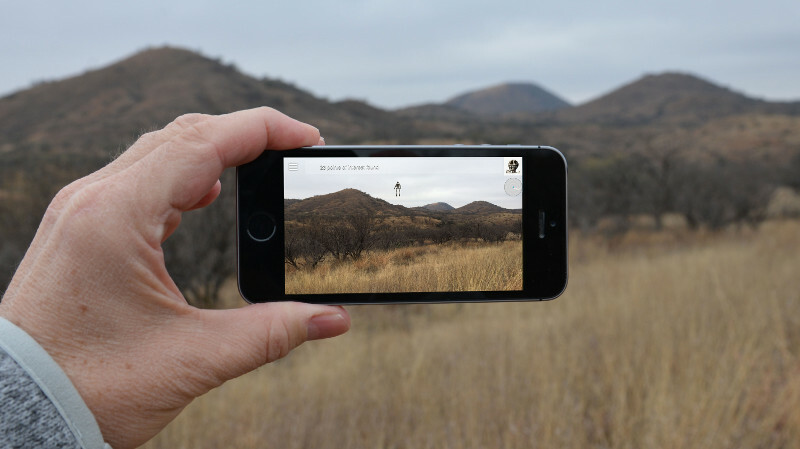 By augmenting the reality of the landscape depicted in the project, the ghost lingers in the landscape even after it is no longer visually depicted in the screen of the smartphone. When I put that screen down, the landscape around me is the same as that which was replicated on the screen, but something is missing and that lack, that disruption, those questions linger. It reminds us that the landscape around us we consume visually is not the entire picture, or that what we visually take in is simply another story of how the world works and our place in it. The project, then, forces us to be in a different place, and be part of a different story. Border Memorial: Frontera de los Muertos, Border Memorial Screenshot Sequence, augmented reality public art, Southern Arizona, 2015. Each calaca is a new encounter, a rupture in the visual landscape, one in the yard of someone's house. 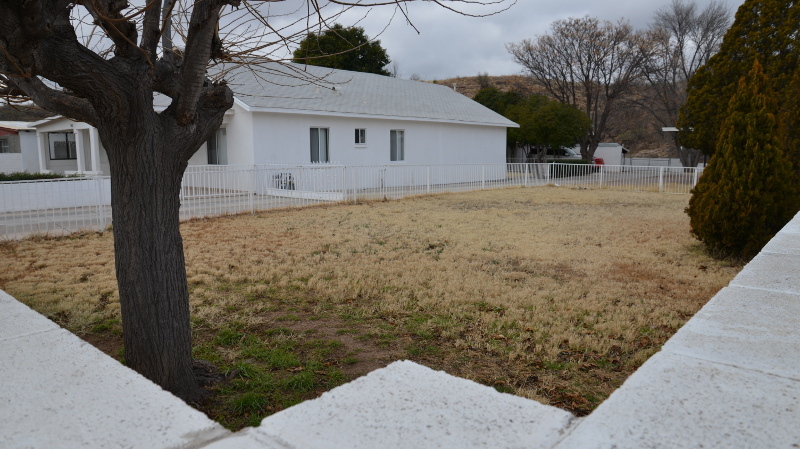 The white fence, a marker of someone's home, of the fantasy of belonging, coexists in the visual frame with the calaca, the visual marker of the loss of a loved one, a disjuncture of belonging with one who didn't belong, whose death is a representation of the violent exclusion that characterizes both the life and the death. One calaca coexists with the plain white cross which we can imagine being the lingering memorial for the individual. There are two markers, then, together, both overlaid in the landscape, both alternative visualizations of the same life and death. If one follows the markers, one may end up in a cemetery, stumbling across graveyards following death. In these images, in these sites, there is a double burial, a partial story, which we cannot know. Did the migrant die in the graveyard itself, on top of the graves of others? Does one of the graves also contain the migrant who died in this same site, or did two sets of remains briefly inhabit the same physical space? 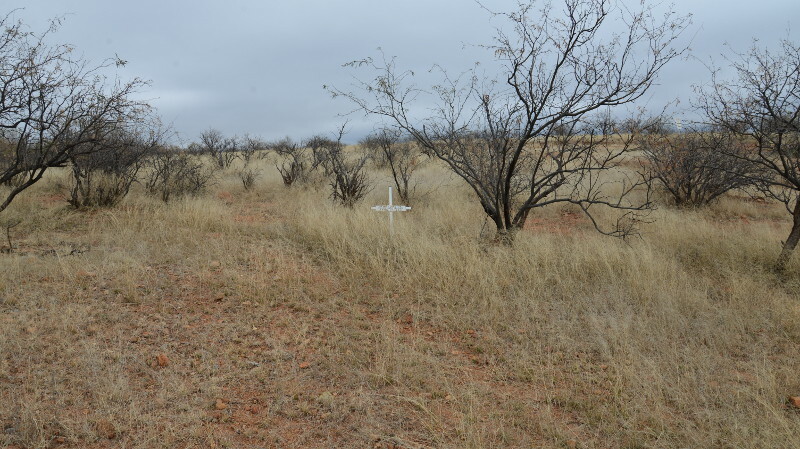 We cannot know, because the project is not keeping track of where migrants who have died are buried, but rather where their remains are found, and there is something important in this partial story that forces us to consider mourning beyond the traditional placement and space associated with the project of burial. The calaca mirrors the invisible set of remains within the grave, which we cannot see because it is buried, and the invisible set of remains that is not depicted visually in the landscape until the calaca appears on the screen. In that sense, there is a poetic open-endedness about the images, about one's own encounter with these visual markers. It is not about the individual story, but about stumbling across a graveyard while practicing grieving and mourning for the migrant, about the disjuncture of weather so effectively captured by the images: all at once there is snow, cold, heat, and sun, the vagaries of the landscape that render our own human existence so precarious in these places and sites. In this vein, it is not simply comprehending the migrants, and their lives and deaths, but also making the landscape itself comprehensible, where the landscape appears differently from different angles, a new story of how we can, materially, and should, ethically, interact with space and place. AUGMENTED: Maish Vaya, Arizona, 2015. Other sites depict two skeletons together, and I wonder whether they died together, a poetic death of two interconnected lives, or two strangers, or whether this is simply a well-trafficked route for migrants, and their togetherness in the augmented frame is simply random. In another image, a skeleton is poised looking out as the sun sets across a road; we see a street corner; we see a set of train tracks. In some of the images, larger political references can be noted, such as in the image where the border patrol is driving by, or where we can see the colored plastic markers left by the medical examiner's office when they found a set of human remains: a colored plastic marker shares the frame with the calaca, itself a marker as well: all ruptures in the way we normally interact with the landscape around us, as calacas crop up where we do not expect to see them. At the same time, my smartphone, the very thing that connects me most with loved ones, with my place in the world, my own digital life, through which I receive work emails, play games, interact on social media, and consume news about current events, has become an instrument of this rupture. It is not only my visual landscape that has been transformed, but also my personal one. My phone, and my own digital double, has itself become a container of the memory of this encounter, and will never be the same. It has permeated to the virtual and data layers of my own subjectivity. 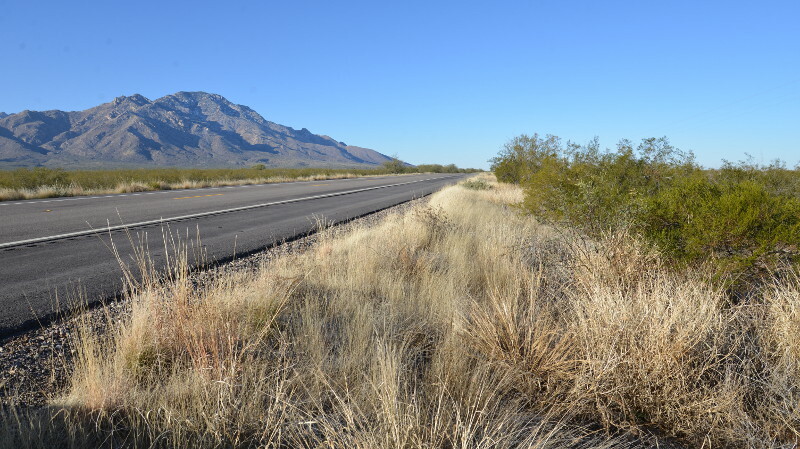 Border Memorial: Frontera de los Muertos, augmented reality public art, W Tucson-Ajo Hwy, Arizona, 2015. The project reminds us that we need to be mindful not to reify the body or the biography of the migrant crosser. By positing a complex spatiality, its focus is not about seeing the agentic body of the crosser, but about a ghostly visuality that disrupts both body and space. The user sees through their mobile device both the physical space as it is, and the physical space as it isn't: both are realities. The calacas appear ghostly because they crop up in the landscape unexpectedly, and disappear as quickly as they have appeared, or as soon as the user looks in another direction. They are the dead, cropping up in places they are not supposed to be, and asking uncomfortable questions about life and death in border zones. As Henry Giroux has noted, "cadavers have a way of insinuating themselves on consciousness, demanding answers to questions that aren't often asked" (Giroux, 2006: 174). AUGMENTED: N Western Ave. Nogales, Arizona, 2015. 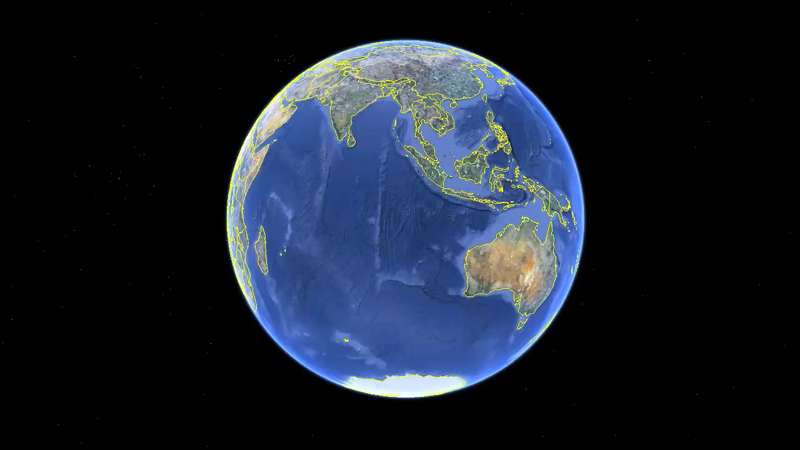 It is perhaps the case that in modernity, borders are no longer the wild and primitive frontiers of lore but, rather, are sites where the state is most visible, as Hastings Donnan and Thomas Wilson (1999) posit, and where its sovereignty is tested the most, as Michael David Sack (1986) has argued. But the way power operates at the border is multi-layered and contested. It sometimes appears stark as in forms of government security at the border itself, permitting certain actors to enter and denying others entry, the very exercise of power that has resulted in the presence of migrants in the desert rather than at a manned border checkpoint. But Roxanne Doty (2001) has demonstrated that statecraft also operates from below at border sites, sustained by a myriad of non-state actors that all operate to "state" the state. Indeed, as Mat Coleman argues, examining the border "suggests a geography of statecraft in which geopolitical and geoeconomic power is not a singular, coherent capacity neatly 'pooled up' at the center of the sovereign state, and then deployed spatially, as if the state is a juridico-economic whole of symbiotic legal-military and market access projects with the border as its place of focus" (Coleman, 2005: 200). While this power is not as solidified or centralized as it is often posited to be, there is an incentive for the state to arrange things so as to depict a border that is controlled, managed, and a function of a centralized mechanism of the state which can impose order even on the furthest reaches of its territory: the borders. AUGMENTED: Brawley Wash, Arizona, 2015. This often extends to governance over life and death itself in the border zone. Indeed, it is the extension of securing practices such as Operation Hold the Line and Operation Gatekeeper that resulted in migrants crossing in more remote and more dangerous areas, leading to an increased death toll. These migrants are framed as ungrievable lives because to memorialize them would be to bring into question not simply the permeability of the border, but the fixity of the state's territory itself, and its founding myth that the lives of its citizens are worthy of protection, even at the cost of the lives of others. The state must posit the life of the other as ungrievable and unmemorializable as a prerequisite of statecraft itself. Human vulnerability is governed under a biopolitical framework to the extent that members of the political community are protected from their own vulnerability, and those outside of the community have their own vulnerability rendered a tool of the way the state exercises control over its territorial boundaries. Both are different forms of biopolitical management in that citizens are made to live and the undocumented are let to die. What, then, might it look like to memorialize and grieve the life of the migrant, without coopting their bodies into such a project? Anna Agathangelou (2011) has focused on bodies deemed structurally impossible via the ontological violence associated with colonization. As Agathangelou theorizes, subjects are positioned into structures of governance and violence wherein a new social death emerges which deems some bodies ontologically dead. Similarly, we might characterize the bordering project of statecraft as one that governs the bodies and embodied processes of migrants, even to the point of their deaths in the desert. Frantz Fanon's project on race, violence, and decolonization in his most famous book, The Wretched of the Earth, as Agathangelou reads it, is to get us to think the impossible place of the black body within the colonial project. The Border Memorial: Frontera de los Muertos project similarly thinks the impossible place of the migrant body in our own national imaginaries, and memorializes this impossibility by drawing attention not to the individual life lost, by naming it, as in traditional memorialization, but rather to the very impossibility of place itself. In this sense, the project reflects on the body of the migrant. 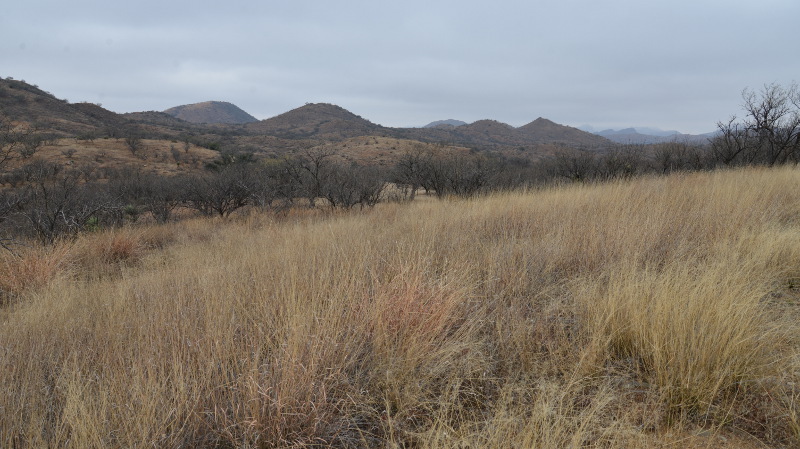 It does not simply advocate that we pay attention to the human remains discovered in the desert, or to the border enforcement mechanisms that have increased border deaths over the last two decades. Rather, it proposes that we engage with the (missing) body of the migrant. Rather than presencing the dead in a strict sense, the project presences the dead in a contingent sense, where the dead migrant appears but only for a moment in the smartphone, and later only as the ghost of the image, and is not presenced in traditional figural form. 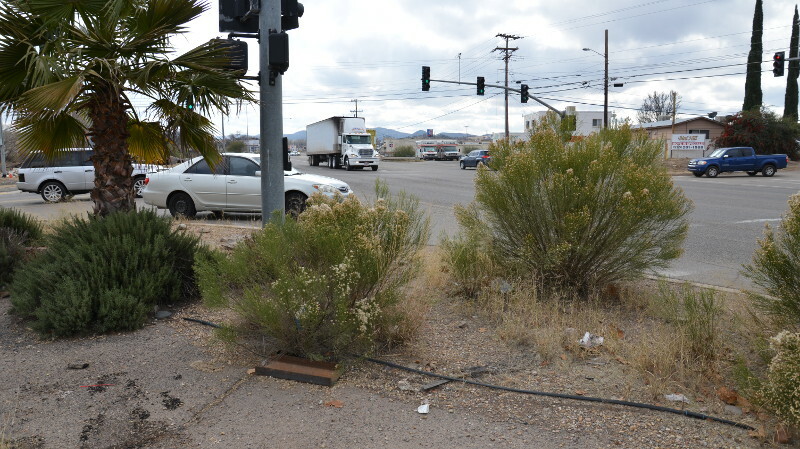 AUGMENTED: Tucson-Nogales Hwy, Arizona, 2015. Many people may not have the chance to have this physical encounter, but they can have a visual one. These images are part and parcel of the project: knowing that these skeletons are there, haunting, in the desert, is enough. And how many undiscovered remains linger in the landscape? Just knowing they are out there has important implications. Being haunted by them without seeing them has the ability to disrupt previously held assumptions about subjectivity and security, a security which often dictates that visible lives are the only ones that matter, indeed, that visibility is a prerequisite for political recognition. Remaining haunted, allowing and opening to one's reality being augmented, is the demand of this project. 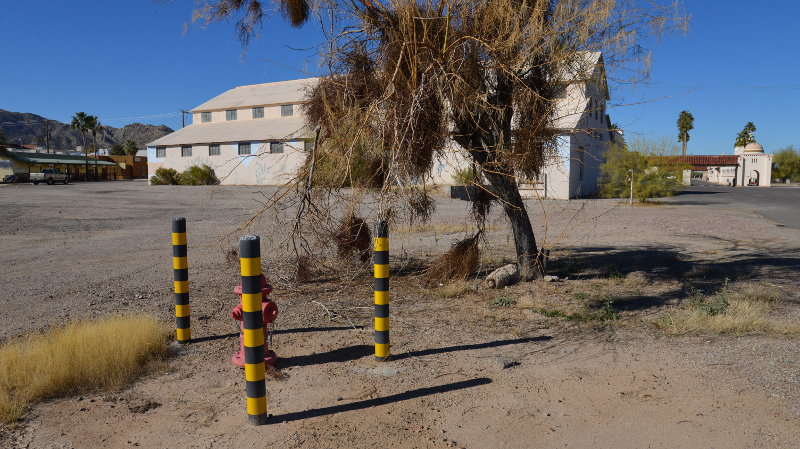 The line between representation and reality gets blurred to force us to question our visual, political, and ethical engagements with the ghostly traces of bordering and statecraft in the Arizona desert. 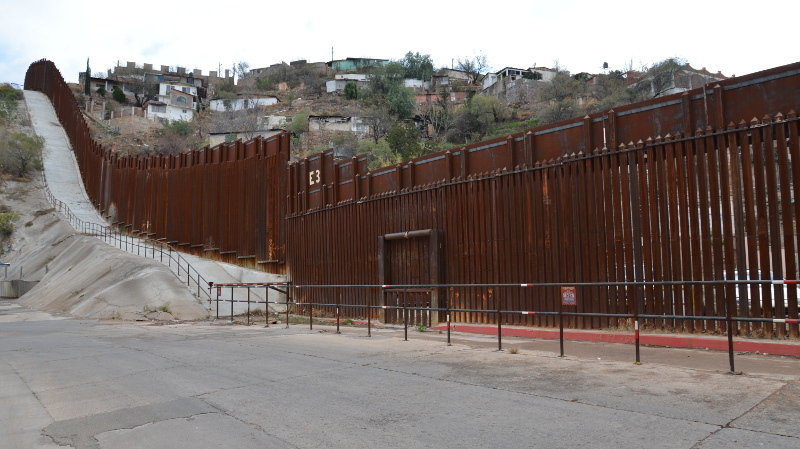 AUGMENTED: Nogales Border Fence, Arizona, 2015. Donnan, Hastings, and Thomas Wilson. Borders: Frontiers of Identity, Nation, and State. Oxford: Berg, 1999. Doty, Roxanne. "Desert Tracts: Statecraft in Remote Places." Alternatives 26.4 (2001): 523-543. Sack, Michael David. Human Territoriality: Its Theory and History. Cambridge: Cambridge University Press, 1986. John Craig Freeman is a public artist with over twenty years of experience using emergent technologies to produce large-scale public work at sites where the forces of globalization are impacting the lives of individuals in local communities. His work seeks to expand the notion of public by exploring how digital networked technology is transforming our sense of place. He has produced work and exhibited around the world including in Venice, Istanbul, Xi'an, Belfast, Los Angeles, Beijing, Zurich, New York City, Taipei, São Paulo, Warsaw, Kaliningrad, Miami, Bilbao, Havana, Atlanta, Calgary, Buffalo, Boston, Mexico City, London and San Francisco. In 1992 he was awarded an Individual Artist Fellowship from the National Endowment for the Arts. He has had work commissioned by both Rhizome.org and Turbulence.org. His work has been reviewed in The New York Times, El Pais, Liberation, Wired News, Artforum, Ten-8, Z Magazine, Afterimage, Photo Metro, New Art Examiner, Time, Harper's and Der Spiegel. Christiane Paul cites Freeman's work in her book Digital Art, as does Lucy Lippard in the Lure of the Local, and Margot Lovejoy in Digital Currents: Art in the Electronic Age. His writing has been published in Rhizomes, Leonardo, Journal of Visual Culture, and Exposure. Freeman received a Bachelor of Art degree from the University of California, San Diego in 1986 and a Master of Fine Arts degree from the University of Colorado, Boulder in 1990. He is currently a Professor of New Media Art at Emerson College in Boston. Jessica Auchter is Assistant Professor of Political Science at the University of Tennessee at Chattanooga. Her research focuses on visual politics and culture, specifically the politics of memory and memorialization post-atrocity, and the role of dead bodies in conceptualizing security. Her book, The Politics of Haunting and Memory in International Relations (Routledge 2014), examines the politics and ethics of being haunted by lives, deaths, and dead bodies: the undocumented immigrants who have died crossing the U.S.-Mexico border, Rwandan genocide victims, and the falling bodies of 9/11. She has recently published articles in Review of International Studies and International Feminist Journal of Politics, and book chapters in Making Things International (University of Minnesota Press 2015), on corpses, and The Performance of Memory as Transitional Justice (Intersentia 2014), on Rwandan genocide memorialization.